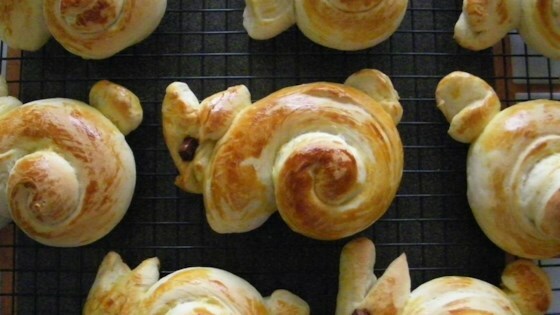 "I love this bunny bread. I make it every Easter and have it at my Easter dinner. Sometimes I cut a hole in the tummy and fill with dip, or eat it as bread with dinner. S0 easy to make and my kids love helping me. I have also made this with rosemary bread and wheat bread." Cut off 1/4 of the dough from 1 loaf and form into a pear-shaped ball for the bunny head. Form the remaining 3/4 loaf into a fat oval shape for the body. Place the body onto the prepared baking sheet and attach the head by pinching the 2 pieces together. Make narrow cuts, about 3/4 in deep, on each side of head for whiskers. Cut second loaf of dough into 4 equal pieces. Roll 2 pieces into 16-inch ropes. Fold each rope in half, and pinch the ends to the head to form ears. Cut the third piece of dough in half and shape into 2 ovals about 3 1/2 inches long for back paws. Attach the paws to the bottom sides of the body. Make two 1-inch cuts on the paws for toes. Cut the remaining dough into 3 pieces. Form 2 pieces into balls and pinch on sides for front paws. Divide the remaining piece of dough into 3 equal pieces and roll into 1-inch balls. Press the dough balls onto the the face to form two cheeks and a nose. Press raisins onto the face to make eyes. Press almond slices close together onto face to make bunny teeth. Cover and let dough rise in a warm place until doubled, 30 to 45 minutes. Brush the loaf lightly with beaten egg. Bake in the preheated oven until golden brown, 25 to 30 minutes. Remove to a wire rack to cool. To serve, line a serving platter with lettuce leaves and place the bunny in the center. Watch how to make a simple, rustic beer bread. This is fun and easy to make and comes out so cute. I've made this several times and it is always a hit. I made this on Easter! Not only was it adorable but it was so easy to do! Everyone loved it!!! I made this for our family Easter luncheon, and it went over like gangbusters! Tasted great and was SUPER cute!!! Very easy to make, as well! I really liked this recipie! I did not use lettuce, though. But i still really liked it! Thanks!!!!!!! !